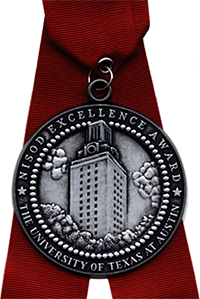 The specially cast, pewter medallions are hung on a burnt-orange ribbon and provided to each recipient at the Excellence Awards Dinner and Celebration held during NISOD’s annual conference, May 25 – 28, 2019, in Austin, Texas. Each spring during its signature annual conference, NISOD hosts one of the most prestigious and well-attended events for community and technical college educators. This is an emotional celebration that Excellence Award recipients and their colleagues and families will not want to miss! Each Excellence Award recipient receives a personalized Excellence Awards Certificate suitable for framing. A special awards booklet lists the names, titles, and colleges of all Excellence Award recipients and features congratulatory ads from NISOD-member colleges. Ads can be purchased here. A list of Excellence Award recipients is displayed on NISOD’s website to recognize this prestigious group. Presentations involving Excellence Award recipients at NISOD’s annual conference are indicated in the Conference Program with a special icon. Excellence Award recipients’ statements and photos are displayed on kiosks during the conference and on NISOD’s website in the conference archive section following the conference. Excellence Award recipients receive a special invitation to author an Innovation Abstracts, NISOD’s flagship teaching and learning publication written by and for community and technical college practitioners. Since 1991, NISOD has been honored to recognize community and technical college faculty, administrators, and staff for their achievements and contributions to their institutions. The work of these men and women includes not only what they do for their campuses, but what they do for students and the communities in which they live and work. NISOD is honored to be able to recognize and celebrate such outstanding individuals.